today at GMT+1 = 11:00 there will be a Sunday sermon radio. Join in. 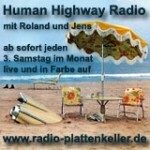 It was: at 19 Feb. GMT+1 20:00h or such, Human-Highway radio went online. Jens presented whatever Neil. Tune in. If Rick Rosas is bored, he’d join in.